Forest Whitaker plays a wise hitman in "Ghost Dog." If there’s one thing that’s impressive about Jim Jarmusch, it’s that he can certainly create a movie-going experience unlike any other. Ghost Dog: The Way of the Samurai is essentially an urban Western-gangster-samurai-crime film, yet it also retains the elements of an art film. The storyline is standard and the characters are far from original (excluding the titular lead character), but Jarmusch is completely unorthodox in his delivery. Forest Whitaker plays Ghost Dog, an African-American hitman employed by the mafia. He follows an ancient samurai code outlined in a book called Hagakure and keeps to himself most of the time, living in a shack on the roof of a apartment building. He communicates to a mobster named Louie only through use of a carrier pigeon. We come to learn that Ghost Dog is indebted to Louie for an act of kindness years earlier and now sees himself as Louie’s retainer. At the beginning, Ghost Dog is hired by Louie to execute a man named Handsome Frank, who seems to be sleeping with the daughter of the mafia boss Vargo, but when the act of violence is committed, she happens to be present in the room. Obviously, this wasn’t meant to happen and the mob tries to cover up their involvement by getting rid of Ghost Dog. Of course, like you guessed it, the story follows the traditional “revenge” formula, yet it isn’t a story about revenge. Ghost Dog (as mysterious as he is) is a man about values: loyalty and honor. He upholds the laws between retainer and master, and never means disrespect. Occasionally, the film will pause as Ghost Dog reads a passage from Hagakure, explaining these moral codes. Here, Jarmusch presents to us a story that is enjoyable. He manages to squeeze in moments of originality and ingenuity, often flipping the formula on its ear, and gives the whole film a stylish quality that you won’t find much elsewhere. You’ll find a lot of it to be implausible (such as a spectacular gunfight sequence between Ghost Dog and an array of gangsters), but it doesn’t really detract from the film in general. 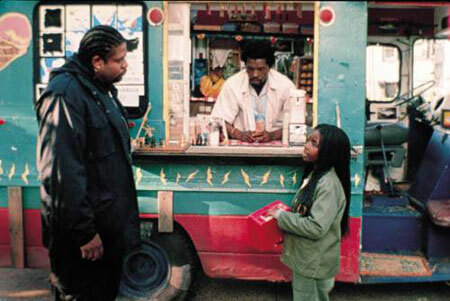 The only problem I really have with Ghost Dog is that Jarmusch adds a lot of really unnecessary social commentary when there”s no need for any. He often detours from the story just to show us a brief and useless look at reality. An example of this would be when Ghost Dog spies a pair of hunters on the side of the road. They’ve just killed a bear and their excuse for killing it is that there were “too many of them.” I realize that hunting is a cruel sport, but the nod towards it is entirely irrelevant. It’s as if Jarmusch finished the script, realized that there weren’t any scenes with “secret meanings” behind them, and went back to cram a whole bunch of them in. Now, you may find yourself frustrated with the slow pace of Ghost Dog as well, but after the first half-hour, the mood changes and things really pick up. It’s a clever ride and one that I doubt you’ll find in most of other films.